My expectations were very high for Casa Ombuto and they were definitively exceeded. Our family's week there was so much fun and will be one of the most memorable family vacations we have ever taken. As everyone notes, Paola is a magician in the kitchen and her personality is exactly what you're looking for in an Italian cooking instructor. Her passion for her work is beyond evident. The villa itself is great, tucked away into the countryside near Poppi with all of the amenities you'd want (a great pool, small spa, amazing views, etc.). In terms of service, there is a true "this is your home for the week" policy, where Sheena & staff really do a great job at making you feel comfortable. If you and your family loves cooking, eating delicious food & wine, meeting great people, and enjoying beautiful views (i.e., you are humans), then don't hesitate to make a trip here!! Along with my family, I just returned from Casa Ombuto and it was the best vacation ever! It was hard to believe that every prior review gave it 5 stars, so we were a bit skeptical. But to our delight, it exceeded 5 stars. We had the villa to ourselves and it was magnificent. Our cooking instructor, Paola and her staff were over the top. Paola was a wonderful teacher, instructive, patient and the food she taught us to cook, which we consumed with great wine, were so delicious Sheenah was a great hostess and all our needs were taken care of. 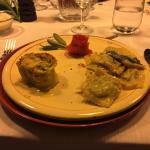 Anyone who is considering going to Italy, taking cooking lessons and just having fun, should definitely to Casa Ombuto. You won’t be disappointed. I'm not sure why it has taken me this long to write about Casa Ombuto. I think I somehow knew it would be impossible to put the magically experience into words and do it justice. Casa Ombuto is a truly special place, and the aura it has is nothing short of phenominal. But I've now resolved that it will be impossible to accurately descibe the experience, and I'm ok with that. On the afternoon we arrived, we knew from the rugged gravel drive and small sign with an olive branch and the words "Casa Ombuto", to Sheenah's warm and inviting welcome. We knew all the reviews we had read countless times were completely true. We arrived in our room for the week, found a chilled bottle of prosecco waiting for us, and from that point on the week was spectacular. The weather was great so we slept with the windows open. On our first night it rained.....and it was perfect. Sleeping in a 17th century villa listening to the Tuscan rain fall outside was heaven. On some nights with the windows open, you can even hear wild boar foraging in the yard and nearby fields. The meal on the first night was a wonderful bistecca, prepared by our intructor for the week, Paola. I say instructor, but she was much, much more than that. She's tough in the kitchen, warm in her heart, and always filled with laughter and caring. Paola is beautiful inside and out. She's a special lady and we are so much better for having the privilege of spending a week with her. The mornings are spent drinking coffee, eating breakfast and visiting with the other guests. Part of the experience for us was to meet people from other areas and to get to know them. We made friends and before long, it was like we'd known each other for years. Sheenah was always there to help us, and we loved getting to know her. My wife and I loved to listen to her. She's a beautiful lady and a wonderful host. The afternoons are spent in the kitchen. After a briefing session of the day's menu, it's all hands on deck in the kitchen. Make no mistake, this is not a leisurely cooking time in the kitchen. I considered it the closest thing I will probably ever experience to cooking in a working restaurant kitchen. It is fast paced, and at times hectic, but always fun and exciting. Paola will test you, and get you out of your comfort zone, and you will love it! Casa Ombuto, Paola, Sheenah, the other guests, the excursions, the day off in Tuscany (I even played golf while I was there), and last, but certainly not least, the food, everything about this vacation was perfect. I know when I read all of these reviews that were all basically saying the same things, I thought "How could this be?" Room tip: Any room will be fantastic. 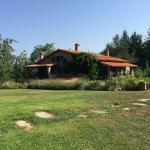 We enjoyed a 7 day italian cooking course and vacation in July at Casa Ombuto.. It was an amazing and thoroughly enjoyable experience. A beautiful location, marvelous views, comfortably accommodation with incredible warm staff who made our stay memorable. 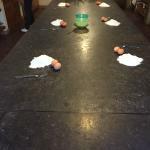 The cooking classes were lively run by chef Paola.. She made cooking fun with a serious under tone! We met interesting people and had a fantastic time as a group. Highly recommend the holiday ! My family and I spent a week at Casa Ombuto with chef Laura doing the mediterranean cooking class. Our entire group had a fabulous time! There are so many positive things to say about this experience that it is hard to know where to start. As it is a cooking school let's start with the food. The food was amazing! Every meal was wonderful. The ingredients are fresh and of course you cooked the food under the careful supervision of chef Laura. I appreciated that the recipes are something that I can cook at home. The techniques are learnable and they do not require lots of exocit spices that you will be unable to find when you return home. Every lunch and dinner are paired with outstanding wines (as well as many after drink options). The service is also outstanding. Sheenah took care of all our needs and more. When we were away from town my mother placed an order at a local shop that wasn't ready for a few days and Sheenah kindly arranged to bring the order to us at Casa Ombuto. I felt very comfortable and well taken care of the entire time. There was also a very fun day of field trips included that were awesome. Finally, the location was gorgeous. 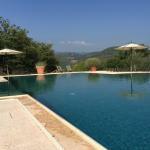 You are in the Tuscan hills with spacious grounds. There is a pool, a hot tube made from an old wine barrel, gardens, sauna, and plenty of places to relax with a good book. Overall, I highly recommend this experience. Thanks to all the staff at Casa Ombuto. We've met lots of nice people in this trip! Our chef Paola and Host Sheenah are very friendly and accommodating. We've also met some new friends in our cooking class, we cooked together and encouraged each other. This is a real holiday for me and I will go back for sure! Thumbs up!!! Room tip: Rent a car to get there.